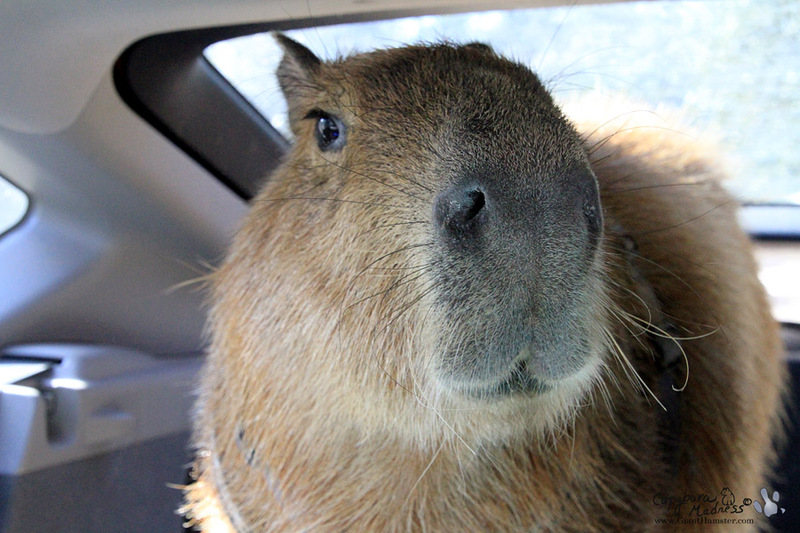 Suspicious things typically involve car rides. I am not a big fan of them. Melly says I am getting better all the time and I guess I don’t sweat as much in the car as I used to, but I still don’t like it. 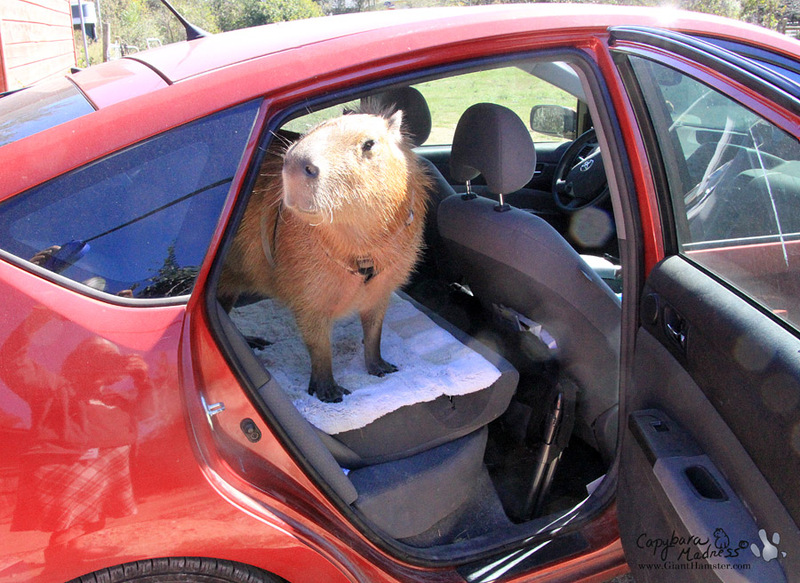 You never know where you will get out once you’ve gotten into a car. We ended up getting out at a school. A school is not home, so I don’t like that. On the other paw, a school is not the vet’s, so I do like that. I kind-of remember this school. I went there last year for Science Day. Last year we were outside and I escaped from my harness so that Melly and Sheldon had to crawl through the brush after me! Ah, those were good times! For some reason, we did our presentation indoors this year. 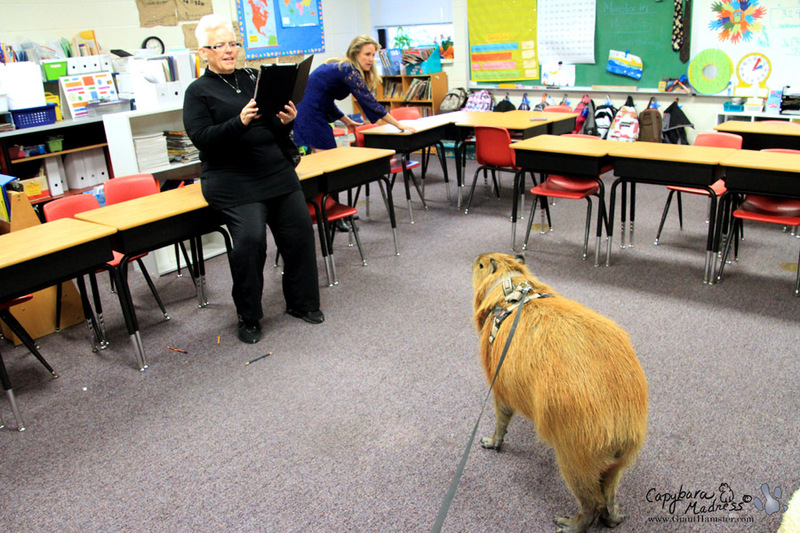 Before the session started, I got a chance to rub noses with some of the school staff and volunteers. Literally rub noses. Melly had two activities for the kids. 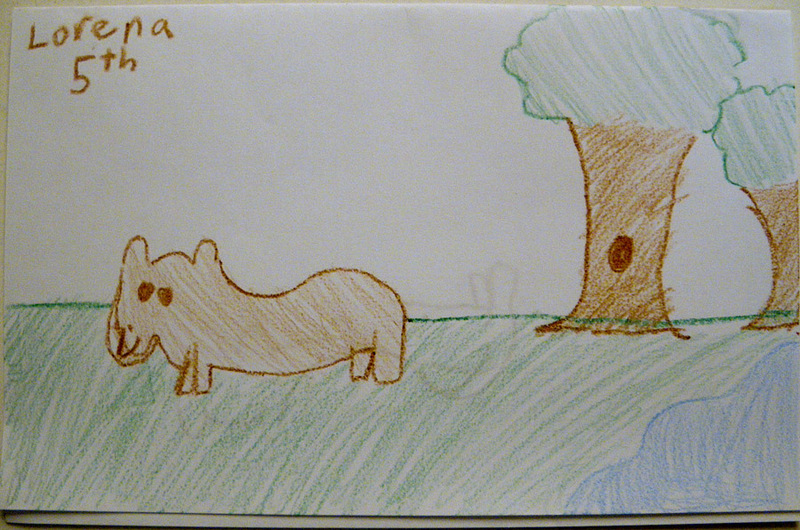 The first was Draw a Capybara and the second was Capybara Find-A-Word. 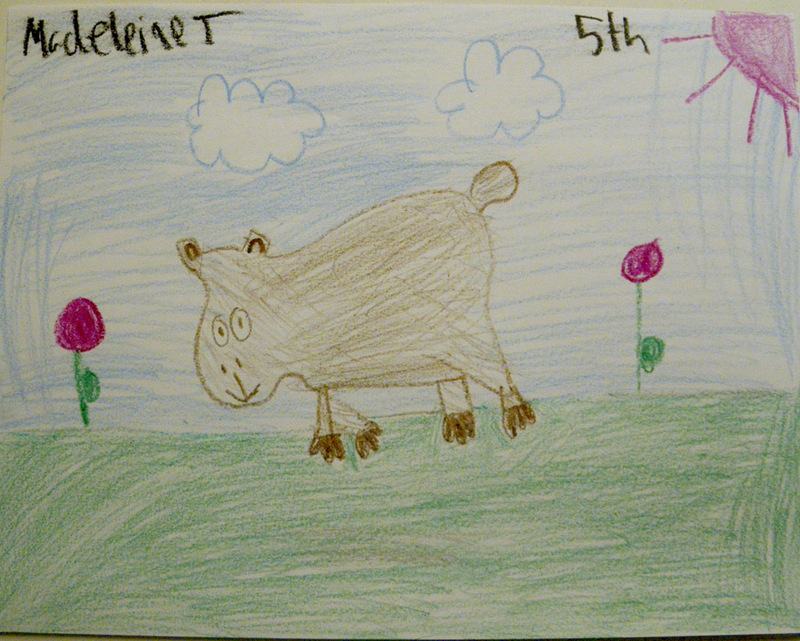 For Draw A Capybara, Sheldon gave each kids a blank sheet of paper to draw on and another sheet with Melly’s capybara drawing directions. You can see them here. 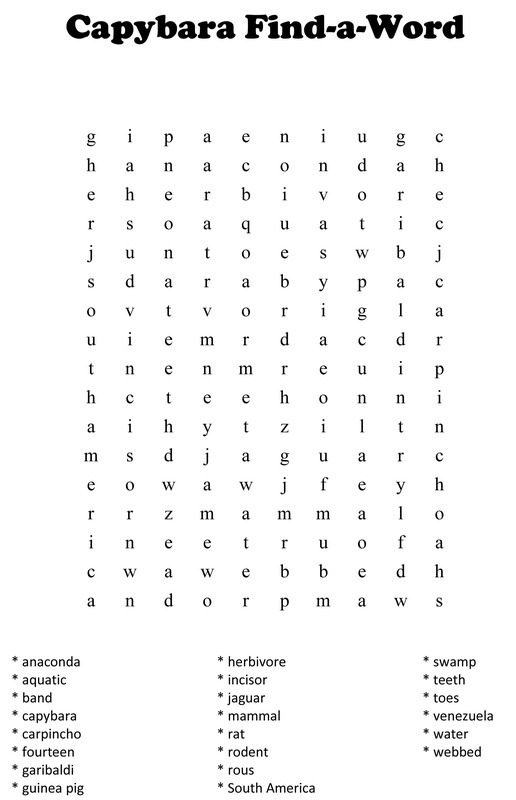 You can try your hand at Capybara Find-A-Word too! In fact, feel free to print it out and use it with your friends or students. 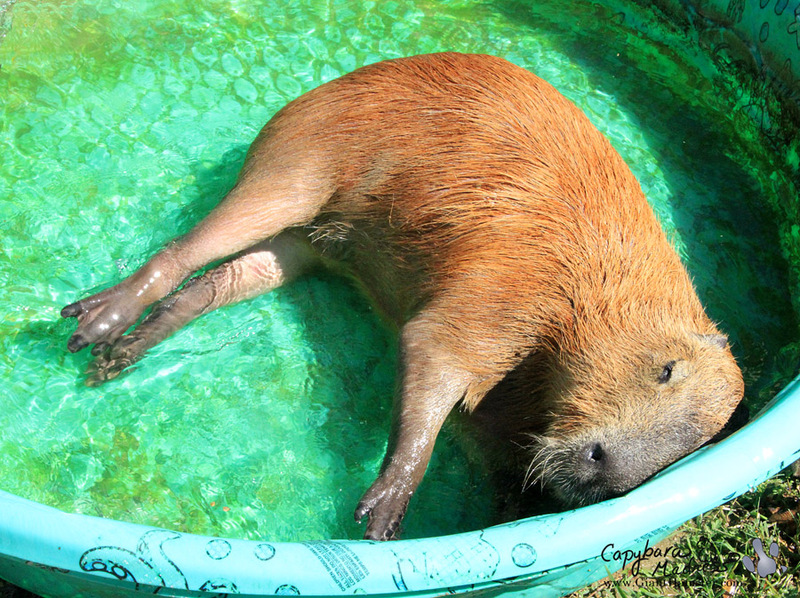 Each of the words relates to capybaras and Melly talked about all of them during her long-winded “science” talk. We did two 45 min sessions with 15 kids from 2nd through 5th grades. I was supposed to hang out in the middle of the room so everyone could see how cute I am. I did better than that. 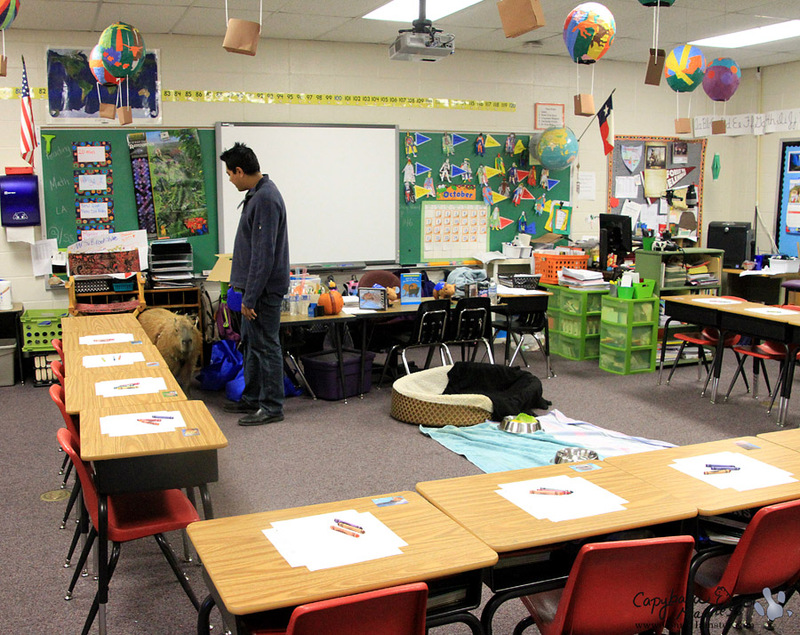 Since I didn’t have to wear my leash inside, I wandered around to all of the desks and let the kids pet me. They were much more interested in me than in how the word fourteen relates to capybaras (it’s the number of toes we have). Part of the reason the kids didn’t pay attention to Melly is that she was giving away prizes. See all that stuff on the table behind me? She gave all of that away. But you had to be the first done with the Find-A-Word or you had to have the best drawing to win something. That meant the kids were busy searching for words or honing their drawing skills instead of listening. That is when they were petting me or admiring my cuteness. I’m going to include just a few of my favorite drawings. Each of the kids had only a few crayons to work with and they did a great job with limited resources. 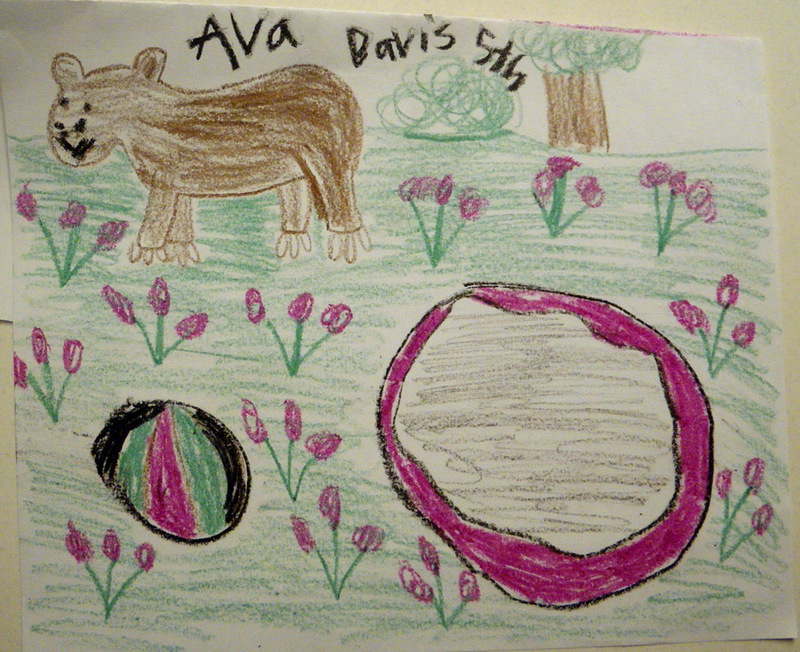 I love that Ava included a little pool and a ball for me to play with. It’s like she knows me. 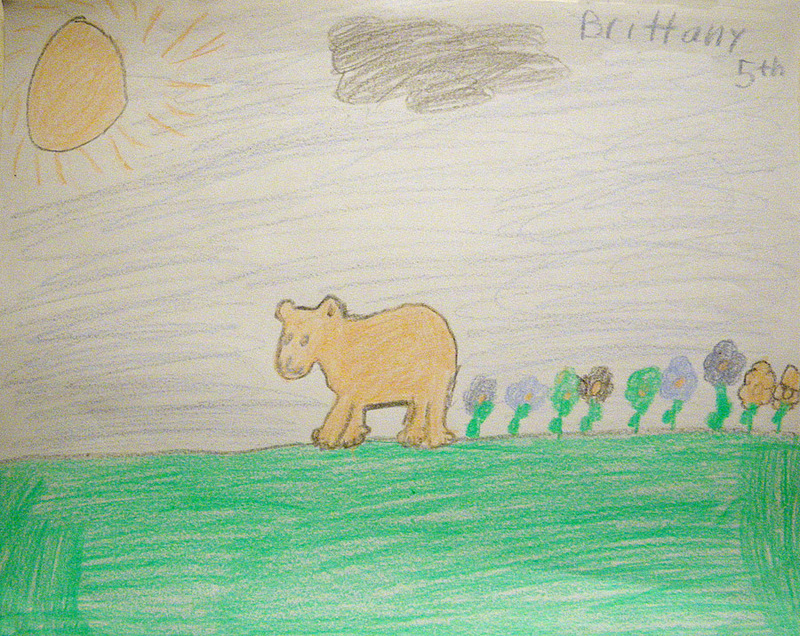 This is a cute drawing, but I want to tell that capybara that he is going the wrong way! 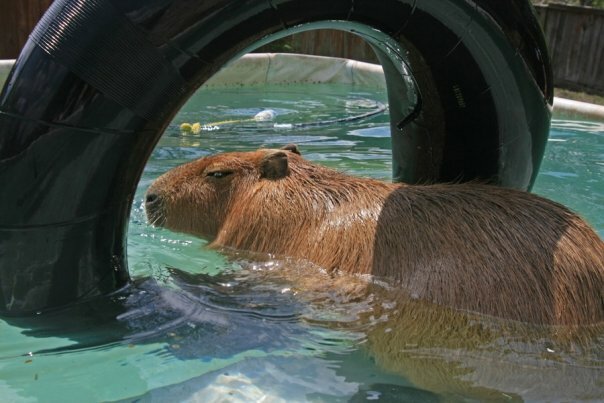 The water is behind him! Melly told the students that I do not have a tail. 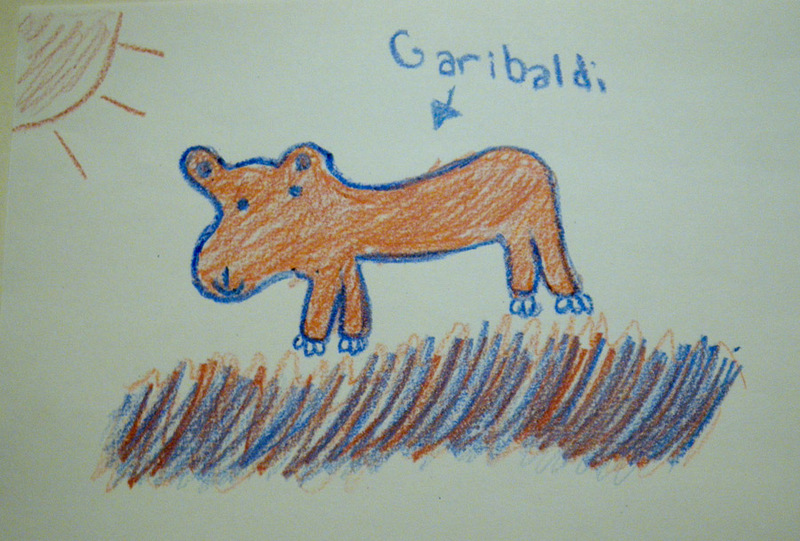 That is not really true, I have a very tiny tail, much smaller than the one in the drawing. 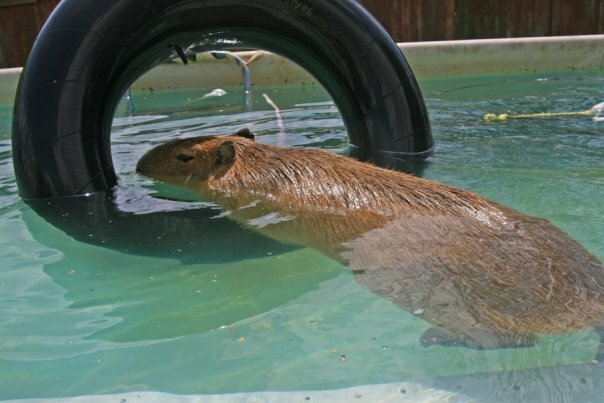 You can read my post, The Tale of My Tail, to learn about it. 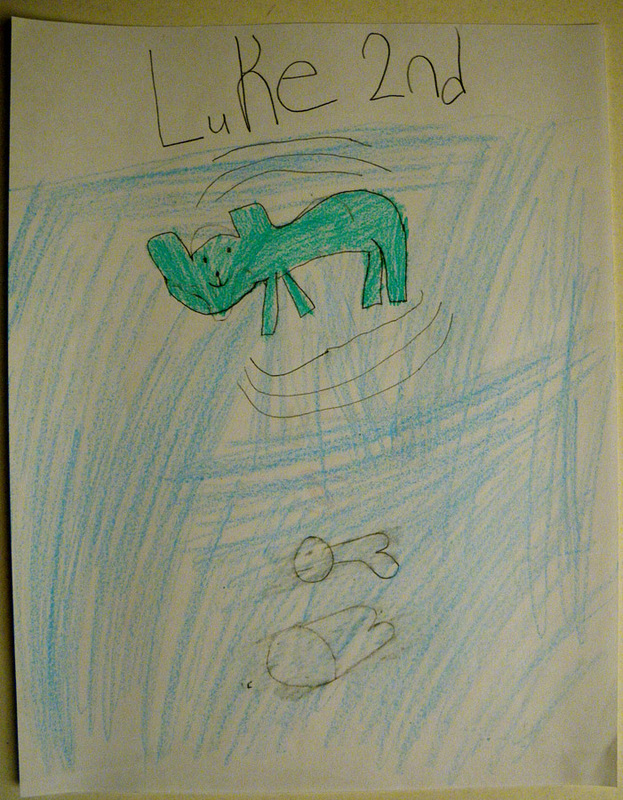 This is my favorite drawing because it shows me swimming! If you know me, you know I am happiest in the water. I am going to assume those things down in the depths are fish and not anacondas or crocodiles. I like it when the car brings me home. 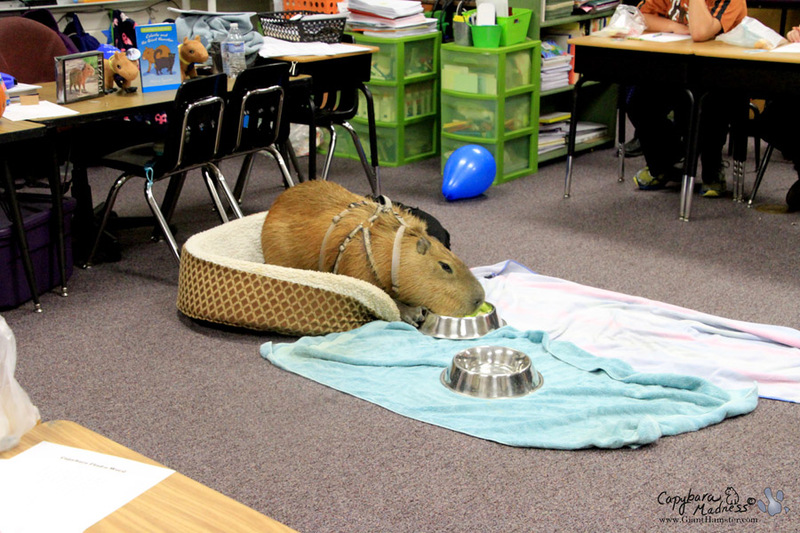 When I think back on it, visiting the school and teaching them about capys is fun, but it is also very stressful. 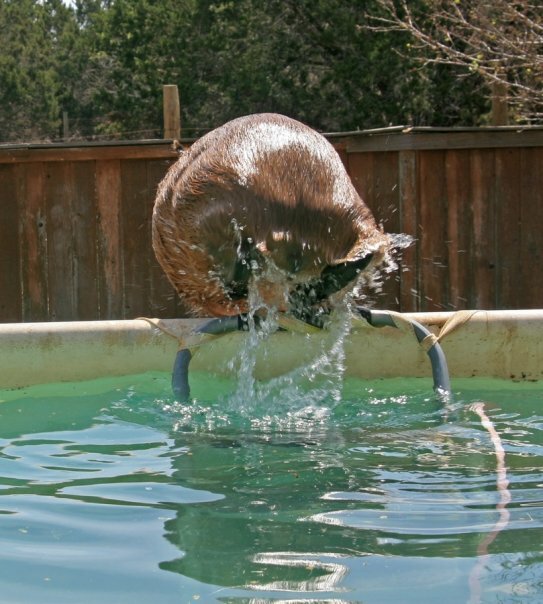 I really needed a swim to get the sweat off my fur when we got home. 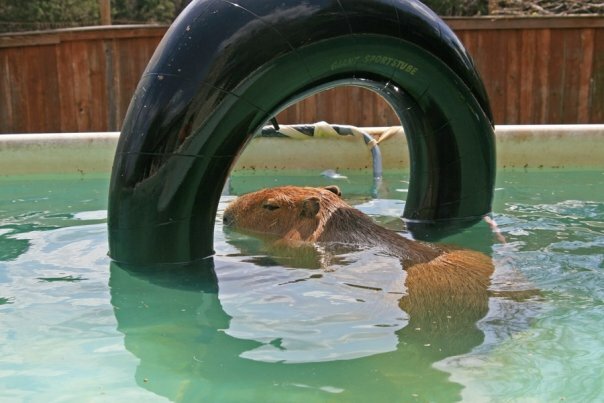 A little roll in my wading pool and I felt refreshed. 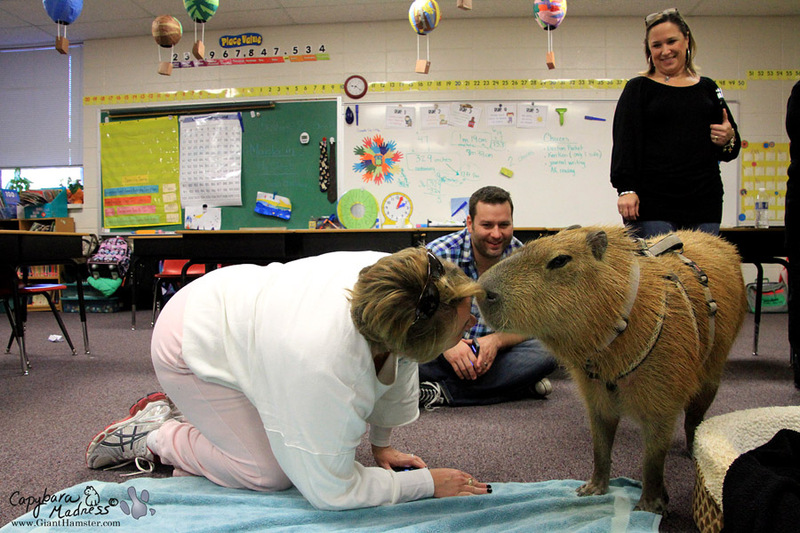 I hate to say that some kids didn’t want to pet me because I was all sweaty. Good job..sounds like the kids learned a lot from your visit. I think you had fun too. Rest and good luck with your visit. I’m sorry that you don’t get to hand out with Sheldon. 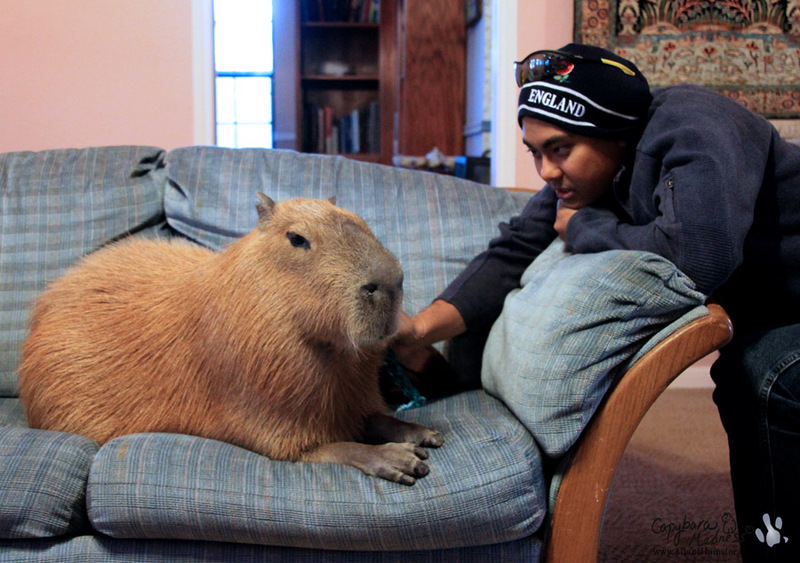 He knows how to treat a capybara!. 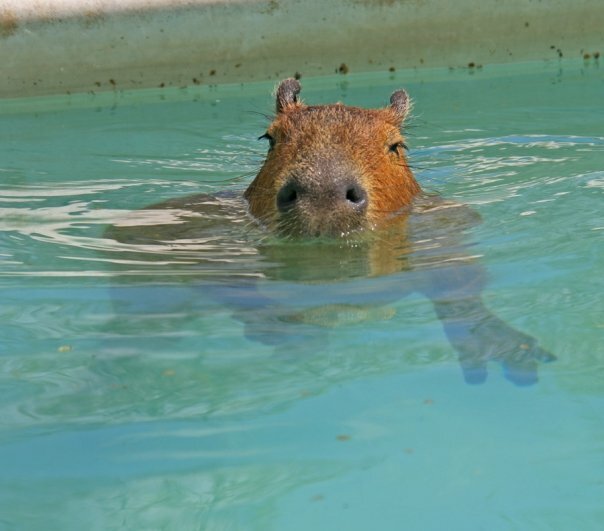 You’re becoming a fabulous capy ambassador! Gari that was so sweet of you to walk around and let the kids pet you. I would not mind if you were sweaty I would still pet you and give you kisses. I really hope you get to feeling better soon and that silly cat does not give you to much if a hard time. I don’t have a tail. Stacy was looking for it yesterday and I got very pouffy, but she didn’t find a tail BECAUSE I DON’T HAVE ONE! Good job at the school, Gari! It was nice of you to talk around and visit the kids personally! See, going in the car to someplace that’s not home CAN be a good thing. You got to be admired by human stalkers and even rub noses w/ them! 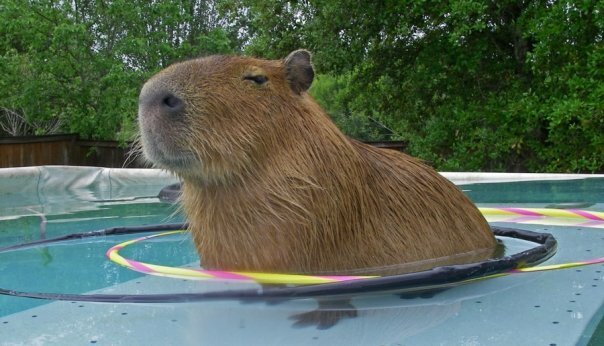 PS: I would pet a sweaty capy! All the drawings are lovely! 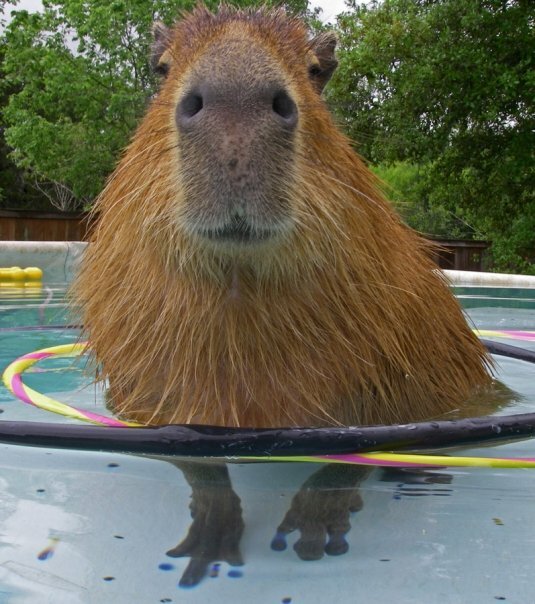 PS I would pet a sweaty capy too but would only kiss a not sweaty one! What a treat for those kids to see Gari up close! I’m envious. I like all the drawings too, it’s interesting to see what parts caught their attention, like toes, etc. Hope you get to feeling better soon, Gari.Healing hugs & prayers. Very nice! 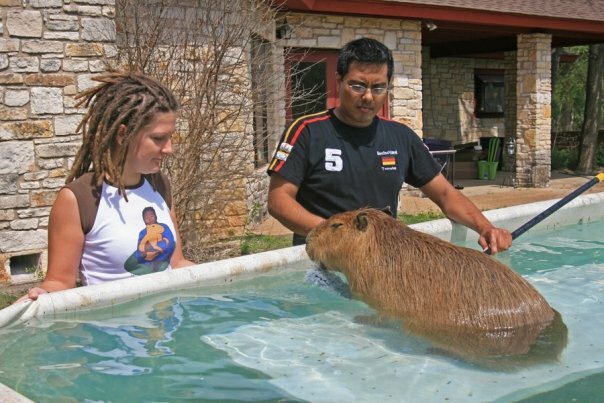 I would pet and kiss and sweaty capy in an instant! Speaking from our school Melanie, the kids are still talking about Gari…..such an impact even in the oldest kids. Your two classes always fill fast and there is not enough of Gary. Thank you, thank you very much for sharing your time, Sheldon, and Gary!! !